High lumber prices have both positive and negative impacts in Mississippi; but are masking Canadian industry concerns re: trade uncertainty, tax competitiveness and regulatory delays. In Wood Products news: Ontario architects get support for tall wood structures; Chicago’s first CLT building only a first step in that direction; an APA study finds flexible structural sheathing products overstate their lateral load resistance; and a Montana company is incorporating old wood into their timber frame structures. 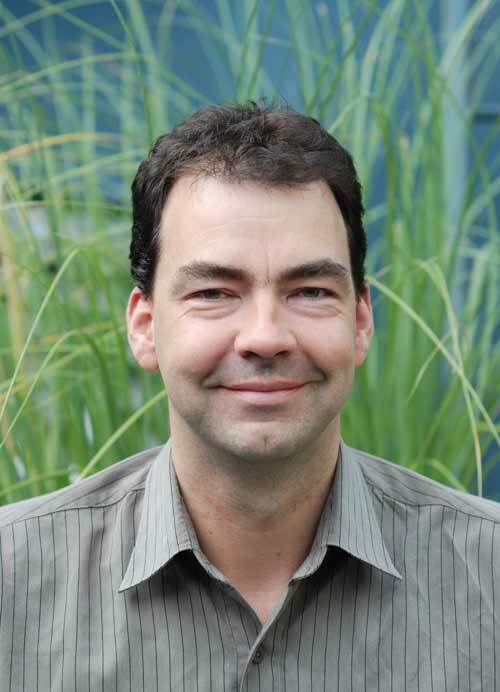 In Forestry headlines: the Sierra Club on BC’s rainforests; the Powell River Peak on logger sports; the Montreal Economic Institute on species at risk; and the BC Supreme Court on former forests minister Rich Coleman. Finally, Hip hop forestry at Yale and Winnie-the-Pooh’s original Hundred Acre Wood illustration sells for £430,000 at auction. The original map of Winnie-the-Pooh’s Hundred Acre Wood by the artist EH Shepard has set a world record for a book illustration sold at auction, selling for £430,000. The 1926 sketch, which was privately owned and had been unseen for nearly half a century, introduced readers to the world of Christopher Robin and his friends in the original book. Purportedly drawn by Christopher Robin himself, the map is littered with spelling errors – “nice for picnicks” and “100 aker wood” – and is captioned “Drawn by Me and Mr Shepard helpd”. Canada welcomes the decision by the United States to rescind its duties on imports of Canadian supercalendered paper and to refund all duties collected since August 2015. On July 5, 2018, the WTO circulated a panel report concerning Canada’s challenge to the U.S. Department of Commerce’s subsidy determination against Canadian supercalendered paper and a U.S. practice of finding Canadian exporters to be non-cooperative, and then artificially increasing the subsidy rate assessed on them during the duty investigation. The panel found that the Department of Commerce’s practices breached numerous WTO obligations. It also found that the Department of Commerce improperly included an inflated subsidy rate for non-cooperation in an average rate for other Canadian companies that were later found to have minimal or no subsidy rates. VANCOUVER, British Columbia and CHARLOTTE, N.C. — Madison’s Lumber Reporter and Forest2Market have officially launched the redesigned, digital version of Madison’s Weekly Lumber Reporter. Madison’sNorth American lumber price reporting service is now exclusively available via SilvaStat360, Forest2Market’s online business intelligence platform. The Madison’s / Forest2Market partnership combines Madison’s lumber price data and market insights with Forest2Market’s SilvaStat360 cloud-based interactive delivery platform. Madison’s Lumber Reporter subscribers now have fingertip access to historic and current lumber price data that is updated weekly and available on a 24/7/365 basis. Kéta Kosman, Publisher of the Reporter, said, “As the North American lumber industry continues to evolve amid the uncertainty associated with global trade policy, operators need access to the most reliable datasets and analytics available to the market. Blue Wolf Capital Closes Sale of Suwannee Lumber Company and Caddo River Forest Products to Conifex Timber Inc.
NEW YORK — Today, Blue Wolf Capital Partners, a New York-based private equity firm, announced the completion of the sale of Suwannee Lumber Company and Caddo River Forest Products to Conifex Timber Inc., a publicly-traded lumber and sustainable forestry company operating in British Columbia, Canada. A portion of Blue Wolf’s proceeds will be in the form of Conifex stock, and Blue Wolf will receive representation on Conifex’s board. The closing of the transaction represents a significant milestone for Suwannee and Caddo, each of which Blue Wolf acquired and invested in after the companies struggled in the wake of the financial crisis. Now that the two businesses are part of Conifex, a larger and more diversified forest products company, they are even better positioned for growth and long term success. …“We are pleased to welcome Suwannee and Caddo into the Conifex family,” said Ken Shields, President and CEO at Conifex. It’s estimated that about 140 communities in B.C. depend on forestry. …It is a sector that is generally doing well right now, thanks to record high lumber prices in the U.S. But it’s an industry is that is becoming increasingly anxious about its longer-term prospects. U.S. duties on imported softwood lumber represent just one of a host of challenges facing the Canadian forestry industry, and not necessarily the one that concerns the industry most. …The oil and gas sector in Canada has been ringing alarm bells that regulatory uncertainty and inertia in Canada has triggered flight of capital. The forestry industry is now echoing those concerns. …Resource industries of all stripes in Canada are facing three major challenges, Derek Nighbor, CEO of FPAC said: uncertainties in international trade, eroding tax competiveness with the U.S. and regulatory delays and uncertainties at the federal and provincial levels. A BC Supreme Court judge has ordered that former forests and range minister Rich Coleman be examined under oath about his knowledge of events at the centre of a multimillion-dollar, multi-year legal battle between TimberWest Forest Corp. and former contractor Ted LeRoy Trucking. Plaintiffs Ted and Rebecca LeRoy are suing TimberWest and several of its former executives over what they claim was a conspiracy to bankrupt TLT and terminate their logging contracts so that TimberWest could subdivide that work among smaller operators and ultimately reduce its timber-harvesting costs. …In a separate but related lawsuit between TimberWest and Munns Lumber Ltd., a judge ruled that TimberWest had breached its contractual obligation to negotiate in good faith when it terminated two five-year contracts with Munns after the companies failed to agree on logging rates. Liverpool, Nova Scotia — An entrepreneur I knew used to say that there’s nothing sadder than a business closing. But he had never been inside a shuttered newspaper, where if the mournful ghosts of the past linger anywhere, they linger there. On Monday, it was just Stephen Bowers and I wandering around in the bowels of 171 Main St. in Liverpool, back where the printing presses once rumbled, where reporters two-fingered stories about fires, car accidents and county fairs, where the linotype operators worked their hot lead alchemy in the days when the Queens County Advance was laid out in such a manner. Small community newspapers are closing all over the place in these print media-challenged days. Twelve days ago the Advance, which printed its first edition in 1878, printed its last. JACKSON, MS — Tariffs are a hot topic right now. But the tariff on Canadian lumber being sold into the U.S. is slightly different than some of the others you’ve been hearing about. Mississippi’s sawmills are busier than they were this time last year. “They were challenged and struggling,” explained David Livingston, executive director of the Mississippi Loggers Association. “…And the prices were so suppressed competing against the Canadian lumber coming in that there was no way for it to grow and become as strong as it once was.” The Mississippi Loggers Association said the tariffs on Canadian lumber have made prices more competitive and increased the demand. More people are buying American lumber, and the price hit an all time high in June. “If the tariffs keep us in a position to keep Canada on an even playing field with us, then that’s where we need to stay,” added Livingston. Indiana exports a lot of wood to other countries, but it wants to make more wood products — like cabinets and doors. The state is working on a strategy to grow the hardwoods industry. Connie Neininger is the director of economic development for the Indiana State Department of Agriculture. She says Indiana is number one in wood office furniture production, but companies like that are facing a lot of competition from industries overseas. Meanwhile, Neininger says foreign demand for raw lumber is increasing. …Director of the Indiana Department of Natural Resources’ forestry division, John Seifert, says the recession took it’s toll on the hardwoods industry and the state hopes to bring some of those businesses back. Seifert says the strategy is unlikely to lead to more logging in the state. TORONTO – Norbord Inc. and HBI joined Mayor Sylvester Turner to officially open the first construction trades training program in Houston, Texas. In a ribbon-cutting ceremony at the HBI Acres Homes Program, Mayor Turner celebrated the beginning of a 12-week training program at no cost to students. The first 14 students have begun preparing for careers in the construction trades to address the labor shortage in the industry and rebuilding in Houston post-Hurricane Harvey. In response to both issues, Norbord made a donation last year to support programs in both Houston, Texas and Tampa, Florida. The first Norbord-funded class in Tampa graduated its first 13 students late last month. “Our partnership with HBI, which was based on our award-winning Thank-a-Framer campaign, has been a tremendous success” said Norbord’s Vice President, North American Marketing and Product Management, Ross Commerford. The 2015 change in the Ontario Building Code that permits wood structures up to six storeys and the resulting surge in the construction of these buildings, seems to indicate that there is considerable support for larger wood structures in Ontario, but for practitioners wanting to pursue a wood structure taller than six storeys, there has been very limited practical support. Mass timber products, for example, are not specifically defined as a distinct material in the current Ontario Building Code. …Fortunately, things have now changed. …Since the 2006 version of the Ontario Building Code came into effect, architects in Ontario have been freed from the compliance constraints of a single acceptable solution (prescriptive path). …The recently released Ontario’s Tall Wood Building Reference… is making it easier for project teams to consider a mass timber structure for tall buildings. Gallatin Gateway, Montana — From log home builder to an employee-owned business, Big Timberworks has found a way to succeed, even after its founder passed away. In 1983, Merle Adams and his partner decided they no longer wanted to build log buildings – they wanted something better. They chose timber frame building. “It’s been around for thousands of years,” said Hudson Hart, Co-CEO Big Timberworks Inc. “Timber frames can stand for thousands of years, and when you travel parts of the world you see that (in the) big roof systems of castles and what not.” …“Big Timberworks was actually the first company in this area that started bringing in old wood,” said Hart. “The old wood I’m talking about is what we refer to as commercial salvage Douglas fir. A six-storey cross-laminated timber (CLT) office building will become Melbourne’s first timber commercial building after it received planning approval to be built in Docklands. 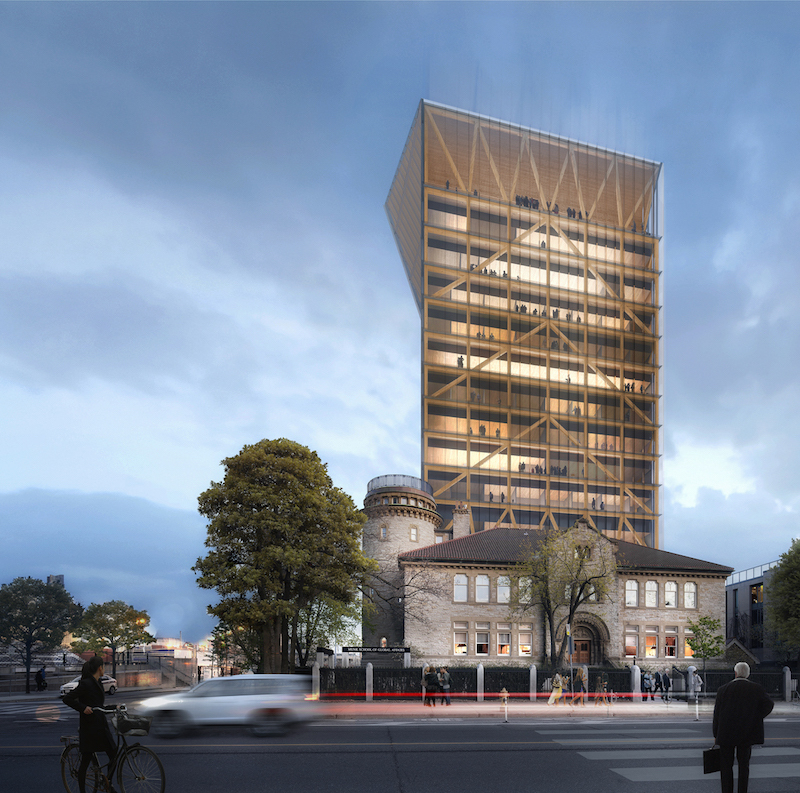 Designed by NH Architecture, the 8,000-square-metre office building will be built with 80 percent CLT and will sit atop an existing concrete building. …“This is a unique building which has 5.5-star NABERS and Green Star ratings due to the use of CLT, which has the structural strength of traditional concrete and steel but dramatically reduces the building’s environmental impact,” said Anthony Park of CBRE, the agency tasked with marketing the building. The approval of the building, dubbed Woodwork, follows a number of timber buildings that have completed in the Docklands, including Australia’s first timber high-rise apartment building, Lendlease Design’s Forte Apartments, completed in 2012, and The Library at the Dock by Clare Design and Hayball, which opened in 2014. The first class to go through the Fundamentals of Forestry – Harvesting Practices program in Woss has officially graduated. The 12 students, dressed in their best work gear, attended the special graduation ceremony on July 6 in the Woss Community Centre. The ceremony not only acknowledged the success of the students but also the success of the first year of the program… The Fundamentals of Forestry Program, which ran for 16 weeks, is based on competencies identifies by the BC Forestry Safety Council and developed with VIU to teach both employability skills and safe work practices. …VIU has also received funding from the Ministry of Advanced Skills Education and Training to work with a number of institutions to adapt the program for different areas around the province. Powell River Logger Sports begins on Friday, July 13, at Loggers Memorial Bowl. Competitions at the Willingdon Beach venue continue through Sunday, July 15. …In the case of Verjall Ham, a passion for Logger Sports was born out of necessity. Growing up on a rural island meant that firewood was needed for heat during the winter, and it was Ham’s job to venture into the woods to collect it. Although he now keeps busy by day as an industrial instrument mechanic at Catalyst Paper Corporation, an auxiliary firefighter with Powell River Fire Rescue and a firefighter with Malaspina Fire Department, he still looks forward to swinging an axe or climbing a tree any chance he gets. Astroturf …the well-known artificial turf’s brand name has taken on a new meaning, referring to purported “grassroots” efforts that are actually funded and supported by industry and political entities. …campaigns involved in everything from forestry to fossil fuels look and feel “grassroots”, but many are anything but. In discussions about climate change and fossil fuels, for example, we see groups like Canada Action, Ethical Oil, Resource Works, the International Climate Science Coalition, Friends of Science, and the Canadian Taxpayers Federation, among others. It’s one tactic in the industry playbook. In a recent column, we discussed science-denial campaigns related to climate change and caribou-habitat protection. …In B.C., they go back [to] … logging in Clayoquot Sound. To counter massive protests, the Citizens Coalition for Sustainable Development, also known as Share B.C., was launched with support from and ties to the forestry industry, later spawning a number of “Share” offshoots. The District of Sechelt’s consultation on the Sunshine Coast Community Forest (SCCF) kicked off Monday with a world café event at the Seaside Centre. More than 50 people came out to offer opinions on five questions set by the district… Some of the ideas that came out included making sure the board of directors has a broader base of backgrounds and better gender balance, putting decisions about how to spend legacy funds into the hands of a community-based committee or group instead of Sechelt council, and even having the SCCF ownership expanded to the SCRD, where most of the logging tenure is located. It was also suggested by the people at one table that if the community can’t come to an agreement about the future of the Community Forest, it should be turned over the shíshálh Nation to manage. By Jens Wieting, Sierra Club B.C. Remember the story of the boiling frog? A frog placed in cold water and brought to a boil slowly will not perceive the danger until it’s too late. …The liquidation of B.C.’s spectacular, endangered old-growth rainforests and their mosaic of species follows the same pattern, at least to those who are willing to see it. …Unfortunately, a year into taking power, Forest Minister Doug Donaldson appears in denial about how little old-growth is left across most parts of the province. He believes there is still time to wait and deal with this crisis at a later date. This is wrong. Most of the remaining areas are now so small and fragmented that they can no longer support the web of life as we know it. …Two hundred twenty-three experts have studied what is happening in B.C. and the science is clear. Business as usual will result in ecological, cultural and economic disaster. 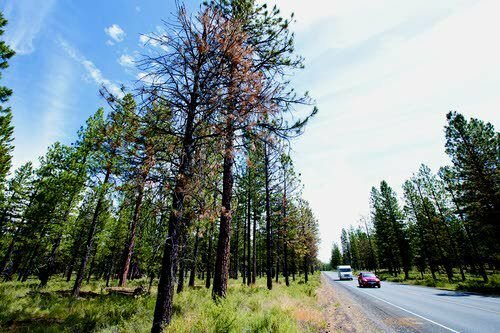 BEND, ORE. A weed-killer that killed thousands of ponderosa pines near Sisters has been linked to the deaths of other trees outside the Sunriver resort community and possibly across Oregon. An investigation spurred by the incident in Sisters found that the active ingredient in the product known as Perspective may have killed dozens of ponderosa pines outside Sunriver and other trees in central Oregon, said Dale Mitchell, an Oregon Department of Agriculture program manager. …The active ingredient in Perspective, aminocyclopyrachlor, has been linked to deaths of thousands of spruce and pines trees outside of Oregon, according to The New York Times. The Oregon Department of Agriculture has notified the U.S. Environmental Protection Agency of the situation. …The county has discontinued its use of Perspective, Doty said. Thomas Rashad Easley, assistant dean of community and inclusion at the Yale School of Forestry & Environmental Studies, describes how he learned to love people and share his truth from hip hop and how to respect the earth through forestry. Bringing them together, he says, has allowed him to connect people who have been unnaturally kept apart to create a better world. 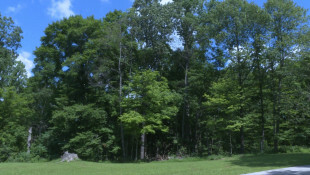 The video is the first in the series “Stories Happen in Forests,” created by the Dogwood Alliance. Help is on its way from Alberta, BC and Saskatchewan to help battle the forest fire concern in Ontario. The MNRF says Fire crews from Alberta and British Columbia have now arrived in Ontario to assist with the fire situation. Fifteen three-person crews from British Columbia and ten four-person crews from Alberta will be deployed to priority fires tonight. 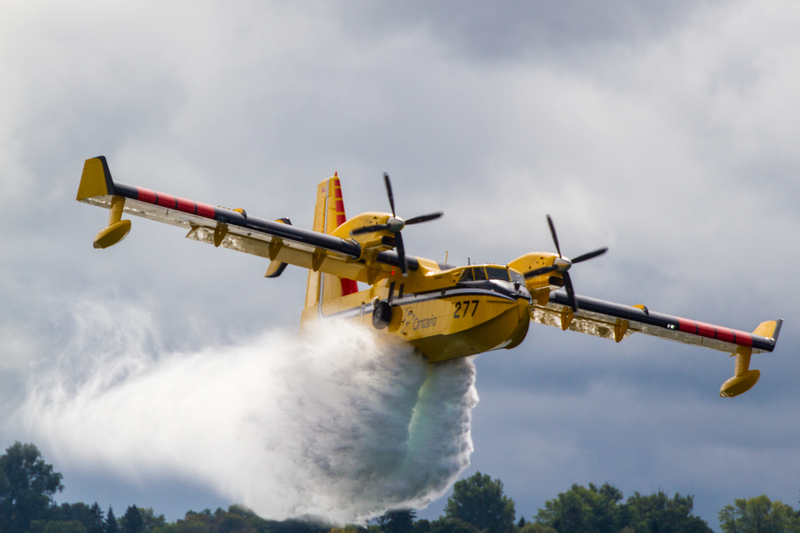 In the air, CL415 waterbombers and T802 Fire Boss amphibians equipment from Alberta and Saskatchewan are currently supporting Ontario’s fire suppression operations as well. This morning, there are 69 active forest fires in Northeast Region. A total of 27 of these fires are not yet under control, while 42 are either being held, under control or being observed. 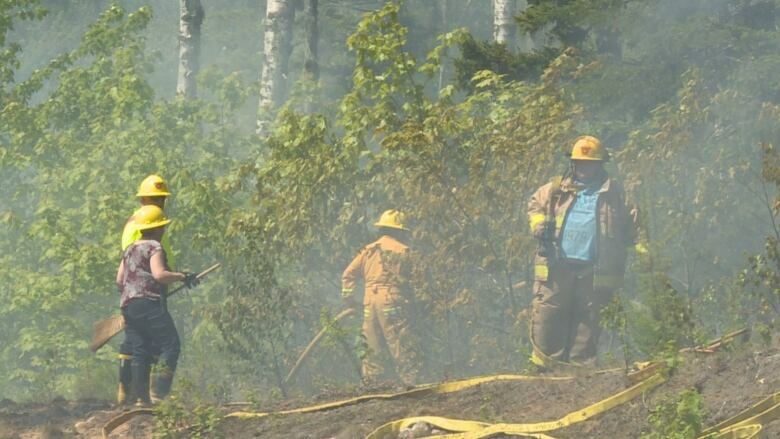 After more than 200 forest fires this year, New Brunswick’s fire prevention officer is hoping for rain and cooler temperatures to slow things down. Since April, fire crews have put out 208 fires across the province, including two fires earlier this week. A lighting strike ignited a blaze south of Mount Carleton Provincial Park that grew to three hectares, according to the Department of Energy and Resource Development spokesman. The other fire, in Bantalor, about 35 kilometres west of Chipman, reached five hectares Monday. The Ministry of Natural Resources and Forestry is setting up a base camp at the River Valley outdoor rink in West Nipissing. Fire crews will be stationed there to help gain control of two area forest fires, according to West Nipissing Emergency Services. 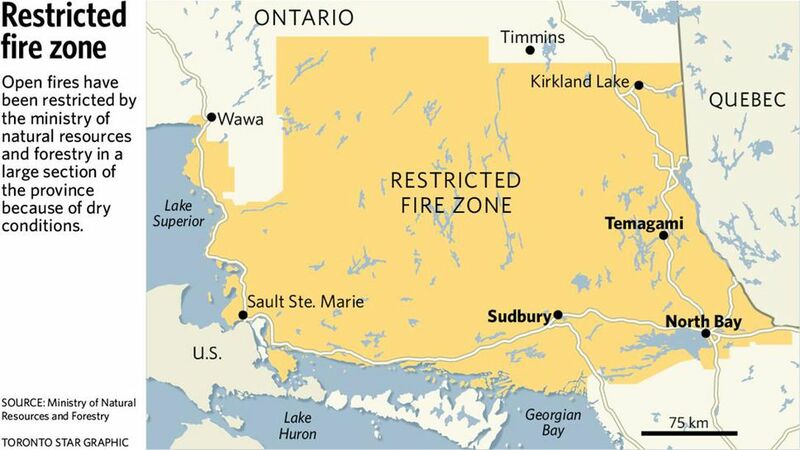 In addition to a forest fire in Temagami being as close as 35 kilometres away, Fire Chief Richard Maranda said there is a fire 15 to 20 kilometres north of River Valley. “If the winds don’t switch, these fires should keep away from River Valley,” he assured. Maranda said West Nipissing also is monitoring the situation. A massive swath of the province outside of North Bay continues to burn after lightning from storms triggered fires that are raging out of control due to high winds. At least 3,000 hectares are in flames in the North Bay district, which stretches from north of North Bay to Temagami. Further to the north, another 12,000 hectares are burning in Lady Evelyn-Smoothwater Provincial Park. Numerous other fires are being held or brought under control while still others, in less populated areas, are being monitored — part of a trend in the province that already has seen 537 fires this year, compared to the 10-year annual average (360).